For a couple of recent projects we have been asked to provide interesting and informative display units. We decided to build a unit which can be used in a number of different applications. It was designed to look good, be able to show graphics and text, have a couple of switch inputs and be configurable for a variety of uses. The end result was so useful, we decided to produce this design and a kit of the main parts. 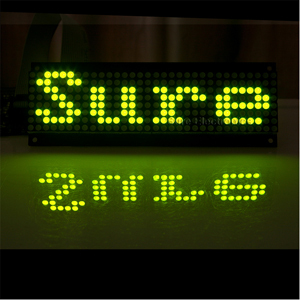 We are using a 32 by 8 LED dot matrix supplied by Sure electronics, based in Hong Kong. They also have an eBay shop. The price ranges from $8 to $16, check eBay first. 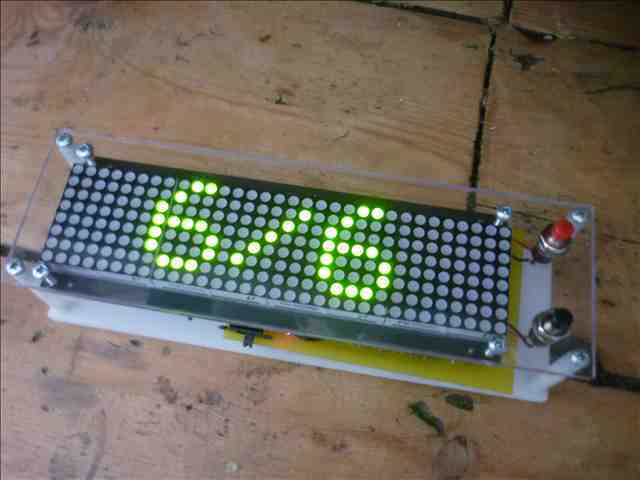 More information about using the LED dot matrix display can be found in this blog post. To keep development time to a minimum, an arduino is used as the ‘brains’ of the unit. 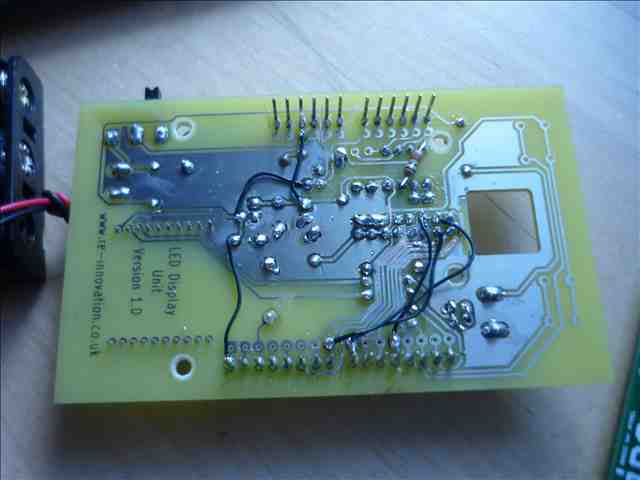 This is a development board based upon the ATMEL 328 microprocessor chip. 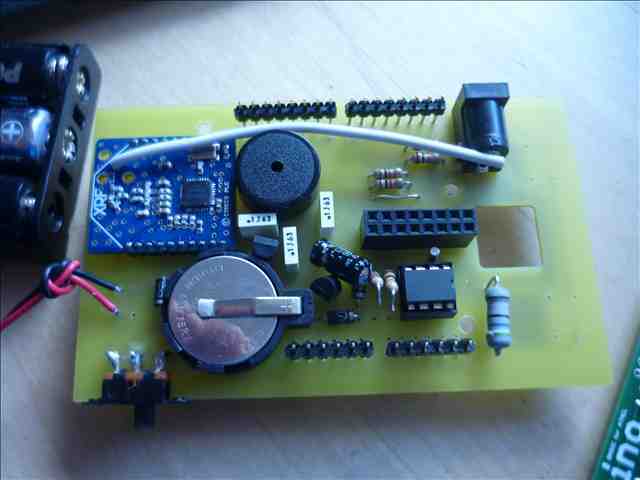 Our units use the less-expensive Xino, an arduino clone from Ciseco. 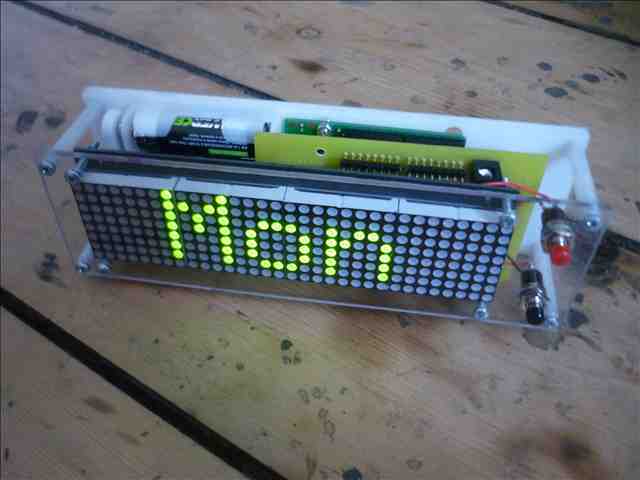 Any Arduino compatible board should fit into this display unit (except the MEGA range). 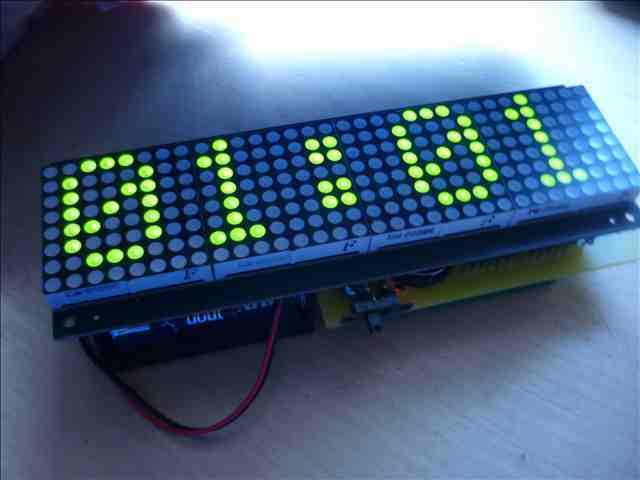 There are numerous open-source examples available for the arduino, hence development time is very short. We have developed a simple clock unit with temperature history display as a sketch to get you going with the use of this display, but the final use is left up to your imagination. The XRF can be seen with the white antenna. 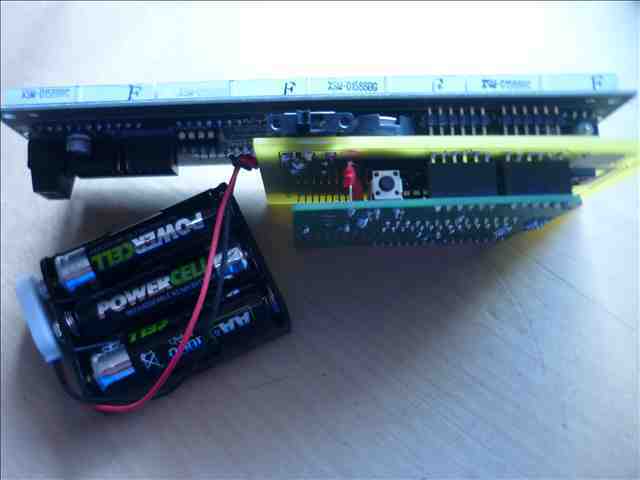 The coin cell battery keeps the real time clock running. We now need to produce a production double-sided PCB. Right click to save the image for higher quality. 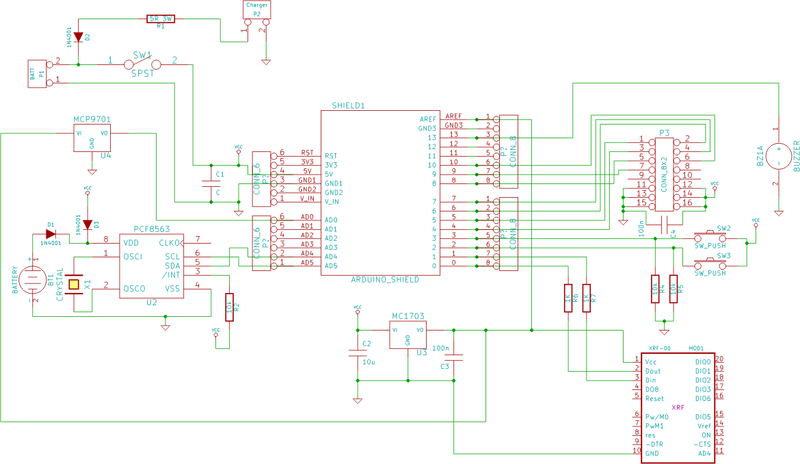 And the PCB design layout. The hardware is mainly two pieces of frosted acrylic plastic which are cut out using a CNC machine. The Xino and LED display bolt onto the plastic and spacers are used to hold the two pieces of plastic together. The design for the plastic was produced using HeeksCNC, the design file is available here. The output g-code is used on our desktop CNC machine run on an Ubuntu machine using EMC2. Note: The kit is not quite in production yet – please email us if interested. 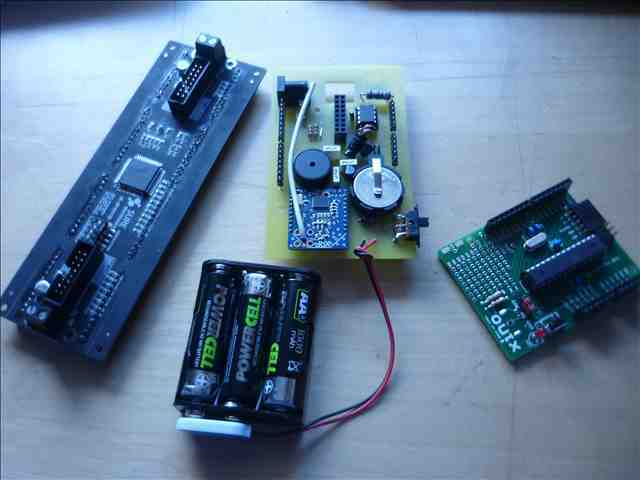 Prototypes of this design have been used in our solar race timer and remote power and energy display. Please contact us if you are interested in purchasing a kit of all the bespoke parts. Sarei interessato alla realizzazione di questo kit. Quoting Guest: Sarei interessato alla realizzazione di questo kit.